Tube amps have a reputation for painting sound in glorious colors. The Schiit Lyr 3 is no exception. These amps are, as the theory goes, perfect if you want to wash your music in smooth, gooey distortion – and not the bad kind, either. We’re talking the kind of distortion that makes basslines rumble, that gives instruments texture, that turns away from crisp detail in favour of rich, decadent, chocolate-pudding warmth. There’s truth to that, because the majority of tube amps can certainly do this. But that’s not all tubes have to offer, and the Lyr 3 proves it. The stock tube that comes with the amp eases up on the low-end warmth in favor of a smooth, neutral presentation. Compare this to something with a bit more energy, like the Feliks Elise MkII (full review here), and you’re going to be a bit disappointed. But that’s not really what it’s here for. The Lyr 3 is far more in line with the Schiit house sound – which, given the fact that the company operates with tongue firmly in cheek, is more refined than you’d think. Tubes can be a particularly idiosyncratic way of experiencing audio. They’re fragile, the internal components break easily, and they get mighty hot. And yet, in a way we can’t quite put our finger on, the Lyr 3’s tube-rolling felt surprisingly easy and natural. Perhaps it’s the way in which the socket is easy to see and manipulate. That’s very different when compared to so many other tube amps (Little Dot, we’re looking at you) - or maybe it’s just that the amp as a whole feels forgiving, both in sound and design. One of the easiest comparisons we can make here is the Burson Audio PLAY (full review here), which allowed you to swap out the op-amps. That, too, felt natural and easy. Although the Burson’s sound is more exciting and dynamic, it’s good to know that, if you don’t like the stock sound of the Lyr, you can change it. Whatever criticisms and impressions of the sound here are, they aren’t set in stone. There’s a lot of detail here, with excellent separation between the instruments. You feel this particularly in the mids, where vocals are given a real lift, burnished to a mirror shine by the tube circuitry. It really feels like they’ve been brought forward into the spotlight, and in such a way that’s never harsh or fatiguing to listen to. If we’re being honest, a touch more detail and sharpness in the highs would have been good – they feel just a little recessed. But it’s a very minor point, and it’s the kind of thing you can easily change up by swapping out the tube. Here’s a guide we’ve written to doing just that. It’s worth mentioning the tech inside the amp - because Schiit certainly didn’t leave the upgrades to the outside. The problem is, we’re not entirely sure how to explain it to those who aren’t familiar with amp topology. Here’s Schiit’s explanation: “This is our unique current-mode, noninverting tube/BJT hybrid topology that eliminates the need for interstage coupling capacitors. These two disparate devices work seamlessly together in this topology, hence the name….Unlike Vali 2, Lyr 2 has no input or output capacitors, no interstage capacitors, and an overkill 5-pole bias servo.” Confused? Us too. But we’re all in favor of tech that makes an amp smarter and more efficient. And although the impact on the sound here is probably very subtle - the difference between this amp and its predecessor certainly is - it’s clear there’s been a huge amount of attention paid to the internals. The really clever bit with Lyr is how you can customise the module on the rear end. You can, if you prefer, order the amp for the straight price of $499 without a module installed. But that would be pretty boring. In all things, but especially headphone amps, it’s always best to not be boring. So, go ahead and spend an extra $100 on either the 4490 DAC (Digital-to-Analog Converter) or a phono preamp for your turntable. If you’re feeling especially flush, you can spend an additional $100 to get the Multibit DAC - a converter with even more advanced processing. This was what our tester amp came with. Outwardly, it doesn’t look like much, but it’s a real pleasure to be able to connect the Lyr 3 with a simple USB connection. It honestly does make a large difference. So, if you have the cash, you should absolutely look at it – although there’s nothing stopping you from using an external DAC, if you choose to. We tested this amp with the included Multibit DAC, and with our own, including the Resonessence Herus and the Chord Hugo 2 (both reviews coming soon). The included DAC was quite good, but there was a clear boost in quality when used with an external one. Not a dramatic boost - just a reminder that slightly superior circuitry had taken over the proceedings. We liked the Multibit DAC module, and we certainly don’t have any qualms about using it, but we’d advise using an external DAC, if you can. This is one mighty fine-looking amplifier. The design is almost identical to the refresh of the Magni 3. The the leading edge is subtly curved, and the silver chassis reflects the light beautifully. There are ventilation holes on the top, spread out in a particularly pretty fan around the tube socket. 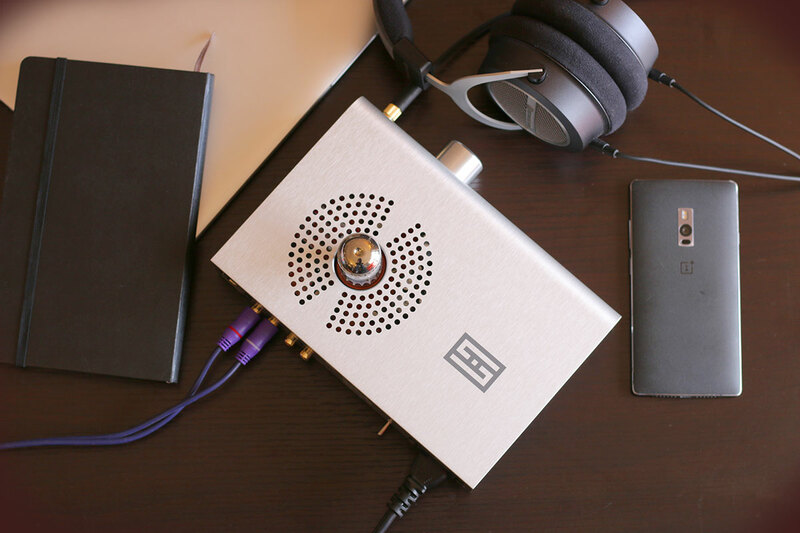 It’s a design that is very much in line with Schiit’s other amps, and many of their products share this aesthetic. And to put this into context: Schiit have a lot of amps in their lineup. Ten, to be precise, including the utterly monstrous $1,699 Ragnarok – and that’s without talking about their extensive range of DACs. The Lyr 3 manages to stand out from this range, and then some. It does that while still managing to push things forward. It’s not often that a sequel product ends up removing an aspect that made the original so memorable, but that’s exactly what the Schiit Lyr 3 does. The original Lyr 2 – which is no longer available on the company’s website – had two tubes, but you could swap in and out as you saw fit. The new version only has one: a single NOS 6N8S that comes included. (If that sounds like gobbledygook to you, read this – or you can just ignore it completely; it won’t hurt your enjoyment of this amp). This is a big change, and one that’s likely to raise eyebrows among those who’ve bought tubes for the previous model. Fortunately, and against all odds, it’s actually a good thing: part of a complete rebuild of the amp that was sorely needed. You get a very well-made volume knob that travels easily, two tiny but firm switches (one for gain, one for input) and a 6.3mm headphone out. While we would’ve liked a balanced headphone output - see here for an explanation of what that is - Schiit say that it would drastically increase the number of components, jack the price, and generally make a mess of things. If you do want a Schiit amp with a balanced output, check out the Jotunheim. You get an RCA input and a pre out, as well as Schiit’s trademark on/off switch – the clunk it makes is still one of the most satisfying sounds in audio world. With your purchase, you also get a choice of tubes at checkout, including the company’s LISST solid-state tubes. And, on that note, we do need to highlight a small problem: if you have any tubes for the old Lyr, you won’t be able to use them here without an adapter. On one hand, we do appreciate that this is a casualty of the rebuild, but it does mean that anybody with an extensive collection of tubes for the old amp is going to be left in the cold. And while were on the subject of tubes: this amp gets very hot. The packaging is minimal, and nothing you can’t dispose of within about five seconds of pulling the amp out of the box. The tube itself comes in a specially-designed foam insert inside its own cardboard container, which is handy. Nothing we wouldn’t expect to see, but it’s good that Schiit are taking precautions to keep things safe. Pulling a nice, new, shiny amp out of the box, only to find that the tube is cracked, would be a bit of a downer. And to be fair, you’d have to work hard to find a company that didn’t do this. When you’re disposing of the box, please don’t dispose of the power cable inside it. You’re going to need that. It’s also the only accessory included here, unless you count the tube. You don’t even get a USB cable for the DAC module, if you’ve ordered one. Although, it’s a pretty standard USB connector, and most of us have one or two of those floating around. In this, Schiit are a little less generous than other manufacturers. For example, The Element from JDS Labs (full review here) comes with its own three-foot USB cable, and it costs quite a bit less than the stock Lyr. The Lyr 3 offers smooth, subtle sound that we found engaging, and which compared well with other amps. The design and build quality are fantastic - the amp both looks and felt great. The Lyr 3’s modular design is a great touch, and it means you can get exactly the amp you want. The price is right - at $499 for the base model, the Lyr 3 matches up well in terms of affordability. There are no balanced outputs on the Lyr 3. That’s not a huge issue, as Schiit has other models that offer them, but it could be a dealbreaker for some. The amp gets hot during playback - not hot enough to cause damage, but you’re going to want to be careful where you put your hands. It isn’t as big a leap forward as the Magni 3 was - it’s more of an incremental step. The world of tube amps can be deep, dark, complex, and occasionally terrifying. This is especially true if you put too much power into a tube, which then explodes, showering you with molten glass. Fortunately, we’re here to help – although, if you need someone to pick glass shards out of your forehead, 911 should probably be your first call. Let’s start with a slightly less expensive tube amp: the Nobsound NS13D. The Lyr 3 is smooth and seductive, while this is a rampaging, snorting monster: a beast of an amp that bristles with tubes. You know that warm gooeyness we talked about? Here’s where you find it - in an amplifier that will deliver huge lashings of low-end warmth and fuzzy distortion. It gives you multiple tubes to play with in a highly functional design. Although the build quality aesthetics aren’t nearly as good as those found in the Lyr, it is cheaper - $289 to the Lyr's $499. If you want something a little bit more refined, and don’t want to bother with this tube business, then we suggest the Burson Audio PLAY. If the Magni 3 is the best amp out there, then this is a close second. It delivers a powerful, exciting sound, in a package that can be as simple or as complex as you want. You can run it as a standard headphone amp, plug it into your PC tower, or even lift the top off and swap out the op-amps. With a price that goes as low as $250 and as high as $550, it’s easy to get the combination you want. The top price is roughly the same as the Lyr 3, which is $499 for the base model. And, as a final alternative, let’s end with one of our favorite tube amps of all time: the Linear Tube Audio MZ2-S. You’ll pay through the nose for it - but it’s absolutely worth the money. This gorgeous amplifier will make you fall in love with music again. It remains one of the single best pieces of equipment we’ve ever tested – certainly the one we most considered ‘borrowing forever’, rather than sending back to the manufacturer after review. It may cost nearly double the price of the upgraded Lyr 3, at $1,235, but it’s definitely worth it. Schiit currently make the best headphone amp available right now: the aforementioned Magni 3. We stand by that, and will happily put it up against amps that cost a high four figures - that includes the Burson or the Linear Tube Audio models. You simply won’t find a better combination of power, sound quality, and value. It’s just not going to happen. Nothing the company has currently can compete with the Magni, and that includes the Lyr. It’s just not as good as this little giant-killer - which is only $99, to the Lyr's $499 base. Then again: is it fair to judge the Lyr like that? We say no. A big, lumbering tube amp like the Lyr 3 is never going to set the world on fire in the same way that the Magni 3 or Ragnarok did, and it was never meant to. Rather, its purpose was, as we described it at the very beginning of this review: to refresh an old line, and turn it into something more relevant to modern trends. In that context, this is a hugely successful update. It more than stands up to its competitors in the space. If you’re looking for a good tube amp, one that can handle just about any headphone you throw at it, then the Lyr 3 is an excellent place to start. It’s almost a right of passage for anybody looking to get into the world of audio. For many, the first stop in upgrading their headphones sound is a little outfit out of Valencia, California: Schiit Audio, pronounced exactly like you think it is.